- Width of the "clime" zones. - Height of the atmosphere. - Extra meridian methods for latitude determination. - "Annotation on the Moon". - Instrument lying on the plane. - Archimedes' calculation of pi. - Copernicus errors in trigonometry. - Solution of higher order equations. - Libro de Algebra: Letter to the Reader. - Rowing: Annotation to Aristotle's Mechanica. Pedro Nunes introduced this instrument in Chapter 6 «De instrumentis quibus astrorum altitudines et distantiae capiuntur» of his Petri Nonii Salaciensis Opera. 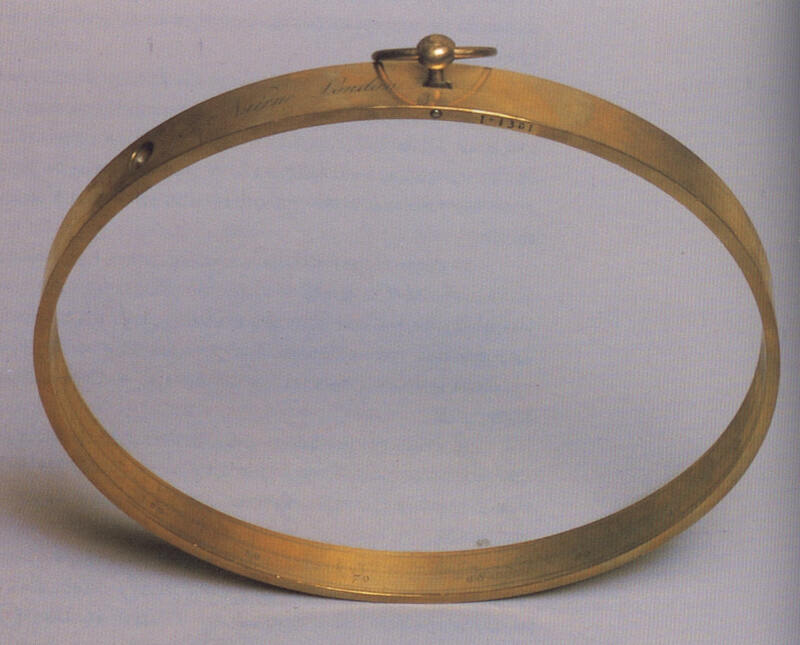 The nautical ring is an instrument suited for solar observations. The instrument has a suspension ring in f. The artisan should drill a hole (as tiny as possible) in g (arc ag is equal to the arc ab=45º) by extracting the section kgh. Nunes advises to take out a similar amount of material at the opposite side b so that the instrument be balanced. The semicircle ceb is graduated from 0º to 90º depending on the value to be taken by the observer (direct reading or zenith distance). The ring should be oriented vertically to the sun so that the light could enter through g. As Nunes states «on this instrument, the degrees of altitude are twice as large as they would be at the common astrolabes(…). In effect, for equal angles, those that have their vertices on the circumference subtend arcs double in length to those that have an angle at the centre». This mathematical property allowed to double the precision of the instrument. The nautical ring did not find continued or lasting use in navigation, though there are still references to its use until the XVIII century. Nautical ring - E. Nairne, London, 17th century. Ø= 275 mm.